Congratulations to the 1st Prize Winners - Burton Glazer and Supawan Sripatarapat - of the Children's Art Competition 2012 on the occasion of the National Children's Day 2012 at Chiangmai Honda Automobile Co., Ltd.
Burton Glazer is studying at the Prem Tinsulanonda International School while Supawan Sripatarapat is at Sarasas Vitead School. Both of them have joined in our 'Art for Kids' class at Galerie Panisa since they were very young. We are proud of you!!! 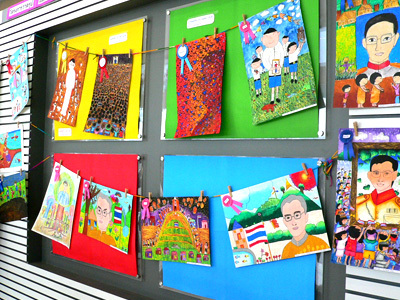 If one discusses the importance of art in Thai society in the past several decades, it can be said that we have given very little attention to art education. 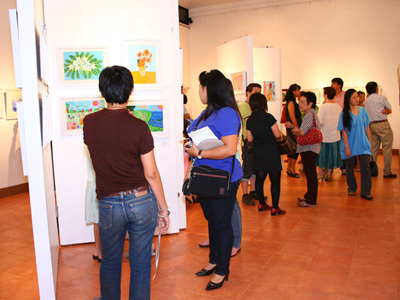 This can be seen at each exhibition through the years: most viewers are artists, art instructors and art students. This may be because there is no true bond between artists and collectors with buying power. Galerie Panisa is a small private body founded to bond artists with students and collectors by creating painting workshops, art activities and professional artists' exhibitions as well as offering art courses for kids, students and art lovers. The result is the creation of a joyful hobby and true appreciation of art. Learning art brings tranquility and peacefulness to our lives. We the students often feel that time flies when we're in art class. The session passes too quickly. What it really means is that happiness springs from art. We believe this kind of feeling is powerful and crucial because it can kill time without using any weapon. 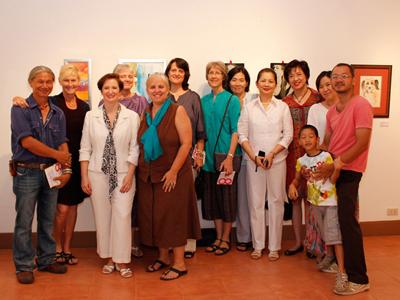 All our teachers here graduated in Fine Arts from renowned universities and have long been working as freelance artists. It's not only their knowledge but also their experiences that help us fulfill our dreams and turn them into realities. Let's come and paint, shall we?